Fashionable, stylish, and updated with the latest trends. That’s how meticulous teens are when it comes to their appearance. Wouldn’t such a fashionable person want to smell good too? Perfumes for teens are an integral part of their grooming, as smelling good gives a pleasant feeling not just for the person wearing it but also for those around them. A fragrance has the magical power to make one feel fresh and confident and accentuates the identity of an individual, all of this in just one spritz. 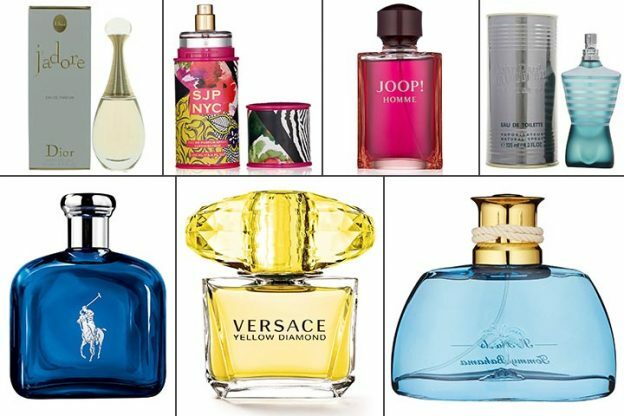 In this post, MomJunction brings to you a list of 21 perfumes that teens might want to use for sure. We give you teen perfumes for girls and boys, and there are unisex options as well. Perfumes for girls need not be just fruity or floral. Their tastes may vary from sporty to laidback or sophisticated to edgy as well. With a plethora of options in the market, here are some of the top perfumes for girls. Though they are categorized for girls, there is no gender discrimination when it comes to perfumes. These may be used by boys, and girls may want to try a perfume mentioned in our next section for boys. Launched in the early 2000s, this perfume has become the signature scent of many. Packaged in a beautiful white and blue translucent bottle, it comes in three variants 25ml, 100ml and 200ml. Light blue contains fragrances of frozen grapefruit, juniper, Sicilian mandarin, and bergamot. Smells fresh, sweet and alluring. A couple of spritzes are enough to last all day. Perfect for all seasons, rain or shine. Some users may find the scent too mild. Manufactured in France, this perfume makes the user feel romantic. It comes in a beautiful transparent bottle with gold detailing on the neck and lid. This Christian Dior perfume comes in 30ml and 50ml variants. It has a combination of various flowers such as violet, rose, floral orchids, and blackberry musk. It has a refreshing floral fragrance. J’Adore has a long-lasting aroma. Slightly heavy on the pocket for a small bottle. Teenagers with sensitive skin may try it once before buying. Black opium is packaged in a shiny black bottle and comes in a 90ml variant. The scent is made of pears and oranges. It is complemented by the woody tones of patchouli. A significant feature about the perfume is the longevity based on the user’s skin type. This perfume was a 2015 Allure Best of Beauty awards winner. A blend of the rich coffee aroma and the sweet sensuality of vanilla. Requires more than one spritzes. Users who do not like a strong scent may find this overpowering. Beautifully packaged, this perfume comes in shiny elegant black bottles of 30ml, 50ml, and 100ml. This fragrance is made of rich and dark accords with an alluring potion of black orchids and spice. The perfume contains alcohol denat, geraniol fragrance, linalool, citronellol, aqua, limonene, coumarin, citral, eugenol, and cinnamyl. It smells intense yet subtle for everyday wear. Smells intense yet subtle for everyday wear. Just a couple of spritzes are enough and does not require reapplication. Users, who are allergic to alcohol, may find it irritable to the skin. Therefore, use it with caution. This fragrance is available in two sizes, 50ml and 100ml. The top notes of the perfume consist of raspberry, Fuji apple, and pomegranate. Jasmine, lily, and hibiscus make the heart and the base notes contain woody notes and musk. Packaged in a pretty pink bottle, it has a cheerful fragrance. Feels fresh and the floral power in the perfume makes you feel rejuvenated, especially if you had a long tiring day. Light, crisp and does not feel heavy on application. Mild and average staying power. Hence, requires reapplication. Clean perfume comes in two sizes of 30ml and 60ml. It has a nice warm smell, which is not overpowering but feels refreshing. Packaged in a simple mint green bottle, this perfume smells fresh and fluffy like warm cotton. Sulfate and propylene glycol free. Does not contain any artificial colors, dyes, talc or mineral oil. May not last long and has to be reapplied. Some users may find it smelling like a detergent. This perfume makes you break free from the everyday routine. It has a captivating fragrance, which is oriental and made up of black orchids, exotic fruits, and florals. Top notes of the scent contain persimmon, pomegranate, and lush green accord. The heart contains lotus blossom, black orchid, champaca flower, and at the base are mahogany wood, liquid amber, and cream accord. Packaged in a stylish curvy bottle, this perfume comes in a 30ml variant. Smells great and thus, invites compliments. The fragrance is clean and fresh but not overpowering. Does not hold and hence does not last long. The tastes and perfume preferences of teen boys can be whimsical and need not depend on the changing trends. If they like a particular perfume, they would invest in it whether or not it is in vogue. They might prefer perfumes that are strong. Here are a few choices if you are looking for perfumes for boys. 360 Red is a fresh, aromatic scent containing a blend of citrus, fragrant woods, spice, and musk. The top notes consist of sunburst mandarin, citrus lime zest, and Italian parsley. The heart of the perfume is made of nutmeg, red cinnamon, clove bud, and coriander. The base in this scent is wrapped with red cedarwood, sandalwood, vetiver oakmoss, musk, and Indonesian patchouli. Packaged in a beautiful red-colored glass bottle, this fragrance comes in a 100ml size. Has a strong, citrusy aroma with a tinge of spice, which makes it stay longer. Ideal for hot summer days when you sweat a lot. As the perfume comes in just one size, it’s bulky to carry around and not travel-friendly. Some users may find the scent to be strong due to the presence of various fragrant woods in it. This classic perfume is best suited to the masculine teen boys out there who are looking for a bold scent. The packaging stands out with the tin can outer cover and a muscular torso which contains the perfume. It comes in three different variants, 75ml, 125ml, and a travel size as well. The top notes of Le Male are wrapped with bergamot, mint, cardamom, and artmesia. The heart consists of cumin, orange blossom, lavender and cinnamon, and the base notes are made of tonka bean and fragrant woods like sandalwood and cedar. The warm, fresh and strong scent lasts long. In spite of being a heavy perfume, it dries down quickly. Some users may find the heavy and bold scent pungent for regular use. The presence of cumin, cinnamon, and fragrant woods may be irritable to teens with highly sensitive skin. Launched in 1989, this perfume is still one of the most preferred perfumes by men. Packaged in an elegant burgundy red bottle, it comes in two variants 125ml and 200ml. The pinkish scent draws its colors from the ingredients of the perfume. The top notes of the perfume consist of bergamot and cinnamon. Heart notes are wrapped with honeysuckle, jasmine and orange blossom. Sandalwood, vanilla, musk, amber, tonker bean and patchouli form the base of the perfume. Just a couple of dabs on the pulse points make it last all day long. Some users may feel the fragrance on their clothes even longer. Has a fresh floral and sweet scent, which makes it attractive. The citrusy notes may smell pungent and brash for some users. Happy is a refreshing fruity fragrance, which is a blend of mandarin orange, citrus lemon, and grapefruit. Packaged in an exquisite bottle, this fragrance comes in 50ml and 100ml variants. The top notes are formed by lime, lemon, and mandarin orange; the heart consists of lily of the valley, freesia, jasmine, and rose. The base notes are wrapped with musk, cypress, guaiac wood, and cedar. Can be worn on any occasion, season and time of the year. Lasts about six hours with just one spritz. Some users may find the scent too subtle and mild. Polo Blue has a musk-like spicy scent. This fragrance has notes of velvety moss, verbena, spicy basil, amber wood, patchouli, tangerine and coeur sheer musk. It is packaged in a classy bottle in blue glass and comes in two variants 125ml and 200ml. The top notes of the perfume are formed by blending cucumber, mandarin orange, and melon. The heart consists of sage, basil, and geranium, and the base notes are wrapped with suede, woodsy notes, and musk. A fruit-filled charismatic perfume, ideal for everyday wear. Very light which makes it a moderate scent; best suited for boys who prefer less empowering scents. May not last long and requires reapplication on hot summer days. Perfect for the beach boys, this perfume is made with an exhilarating blend of guava nectar, sea vine, and blue agave tequila. It comes in a trendy aqua blue bottle of 100ml size. The top notes of the perfume consist of tequila, lime, agave and sea notes. The heart is wrapped with salt, green notes, and guava, and the base is formed by blending palm leaf, vanilla, and musk. The unique scent makes you feel the essence of the Carribean. Has a clean, tropical fragrance which lasts all day long. Users who do not enjoy the essence of beaches and salty water may find it overpowering and heavy. Recommended for casual wear, this perfume is a blend of lemon, orange, cardamom, rosemary, sage, musk and petitgrain. Packaged in a masculine straight cut transparent glass bottle, this perfume comes in three variants 50ml, 100ml, and 200ml. Orange, lemon, petitgrain and sea notes form the top base of the perfume. The heart consists of rose, sage, rosemary, lily of the valley, and jasmine, and the base notes are wrapped with Brazilian rosewood, sandalwood, vetiver, musk, and oakmoss. Is mild but lasts long. It’s light in texture, easy to use and requires just a couple of dabs on the pulse points to make it work all day. Some users may find the scent pungent due to the presence of various citrusy blends. Some perfumes are manufactured for use by both men and women. Such fragrances are mostly delicate, mild, and have neutral base notes, which are often loved by everyone. Here are some perfumes that can be used by both teenage boys and girls. Inspired by diamonds, this crystal-like perfume bottle is available in two variants 50ml and 90ml. It has a transparent and floral fragrance. The top notes of the perfume are a blend of bergamot, neroli, lemon, and pear sorbet. The heart comprises water lily, freesia, mimosa, and orange blossom, and the base notes are of guaiac wood, amber, and precious musk. Has a mild scent and a single spritz does the job. The sweet citrusy smell is perfect for day wear. May not last long and require re-application during the day. Ideal for casual wear, this perfume is a blend of fruits and florals. It is packaged in a beautiful peachy bottle, which comes in 50ml and 100ml variants. The notes of the perfume are wrapped with praline, vanilla, black currant, patchouli notes, and tonka bean. Gentle and mild on the skin. A couple of spritzes last all day long. The lid of the bottle being tiny makes it inconvenient to cover the nozzle properly. This may lead to spillage while carrying it around in your bag. Packaged in a beautiful and elegant creamy, white bottle with gold detailing, this perfume comes in 50ml and 100ml variants. The top notes have the aromas of pink champagne, goji leaves, peach blossom, and bergamot. The heart is a blend of Turkish rose, lotus, plumeria, peony, and jasmine, and the base notes comprise blonde wood and creamy amber. Is gentle on the skin, hence suitable for all skin types. Is ideal for daily use as the scent is mild, stays on the body and lasts long. Users who enjoy strong fragrances may find this to be light or even neutral on the body. Bold and daring, this fragrance is ideal for party nights or special occasions. Packaged in a stylish glass bottle, this perfume comes in two variants 50ml and 100ml. The fragrance is a blend of sophisticated floral notes violet, tuberose, and hibiscus. Has a firm and natural finish. Reb’l lasts long and keeps you smelling fresh even in a hot atmosphere. Users, who enjoy mild perfumes, may find it intense and heavy to use. Elegantly packaged, this beautiful transparent perfume bottle comes in a 100ml variant. The perfume has notes of kiwi, watermelon, musk and pink cyclamen. Fruity flavors give a fresh and citrusy feeling. The scent is mild and soft, yet lasts long. Does not irritate the skin as the ingredients are gentle. The perfume comes only in a 100ml variant, which makes it difficult to carry around. This perfume filled with fiery spicy undertones, is available in three size variants 30ml, 50ml, and 100ml. The neat and clean design makes the bottle attractive. The fragrance is a blend of sweet vanilla, soft moss, and milk which form the base notes of this soothing and refreshing scent. The top notes are a mix of currant buds and leaves, pink pepper, mandarin, grapefruit, and neroli. The heart is wrapped with sweet asylum, peony, carrot seeds, jasmine, mimosa, and tuberose, and the base notes are formed by vetiver, sandalwood, cedar, and white musk. The scent is strong and lasts long with just a couple of dabs on the pulse points. Some users may find it heavy and overpowering. Packaged in a stylish abstract print bottle, this perfume comes in three sizes 15ml, 30ml and 60ml. The fruity fragrance is enriched with wild strawberries, Italian mandarin and white osmanthus in the top. The heart notes are a blend of honeysuckle, gardenia, mimosa and red Damascena rose, and the base notes are a combination of rum, sandalwood, vanilla, and creamy musk. Is mild, gentle and not overpowering. May not last long and requires to be reapplied. Not an all-season perfume and best suits cold weather. Perfume is one such accessory, which is invisible but leaves a lasting impression on others. Before buying a perfume, understand your needs, preferences and skin conditions. Though there are several options in the market, we have chosen some of the best perfumes, which may fit the bill. What is your favorite perfume? Let us know in the comments section below. Disclaimer: MomJunction may earn a commission when products are purchased through affiliate links given in the article. However, this partnership does not influence the editorial content featuring in our list. Harshita is a graduate in commerce and holds a PG Diploma in Patent and Copyrights Law from NALSAR University. She has also pursued CA and has more than three years of internship experience in auditing.Her love for travelling has taken her to various parts of the world, and writing the travelogues has what brought out her love for content writing.Harshita has experience in writing blogs and is passionate about presenting complex subjects in an easy-to-comprehend manner.In her spare time, she works on vegan activism, rescuing animals in need, and trying vegan delicacies.